Hello once again intrepid capsuleers! This is CCP Fozzie bringing you another Dev Blog about a few of the new Mobile Structures that will be available to you with the upcoming release of Rubicon 1.1! When we released Rubicon two months ago we introduced the concept of Mobile Structures, a set of deployable objects that allow players to have more control over their local environment and that represent the first applications of our completely new space structure codebase. We have enjoyed watching as our players took advantage of these structures and explored the new options available to them. Rubicon 1.1 will contain five new Mobile Structures, three of which are aimed at “farms and fields” gameplay and have already been covered in CCP SoniClover’s recent dev blog. The other two are more open ended in their goals, intended to provide flexible tools that creative players can use in a variety of ways. Open ended tools are one of my favorite things about sandbox games like EVE, where being among the first to come up with a completely new non-obvious strategy is extremely rewarding. This blog will contain a quick status report with statistics about the original Rubicon structures, coverage of these two new 1.1 mobile structures, as well as an update to the plan for the previously announced Encounter Surveillance System that we are implementing based on the valuable feedback we have received from the player community so far. In our Rubicon 1.0 release last November we introduced our first four Mobile Structures. These structures were based on completely new space structure code and were far simpler to deploy and use than any previous EVE structures. We have been very happy to see how quickly players have embraced these new tools and started using them to improve their gameplay. In the slightly over two months since Rubicon launched, we have seen a flurry of mobile structure activity, led by very rapid adoption of the Mobile Tractor Unit. In this time period, Mobile Tractor Units have been deployed into space a staggering three million times, with an average of about 10,000 unique characters deploying MTUs each day. Mobile Depots have also been incredibly popular, with over 200,000 Depots deployed since Rubicon’s launch. The more advanced and specialized Mobile Cynosural Inhibitor has seen much more modest usage as expected, with a total of just over 500 separate Cynosural Inhibitors launched into space so far. Interestingly, the biggest users of the Mobile Structures by far are those of you running missions for the Sisters of EVE corporation. This may be a sign that those players who switched to Sisters of EVE missions to take advantage of the new SoE faction ships are among the pilots most responsive to new opportunities in the game. An amazing 11% of all Mobile Tractor Unit deployments and 5% of all Mobile Depot deployments have taken place in constellations that are known for their Sisters of EVE agents. We have even noticed different preferences between the groups of mission runners in different constellations. Those of you running SoE missions out of Osmon are the universe’s most avid users of Mobile Tractor Units, while those of you living in Apanake are the biggest users of Mobile Depots. Lanngisi residents fall into the middle, using both structures to a great degree. I haven’t yet mentioned statistics for the Siphons introduced in Rubicon, because we are endeavoring to be very careful with what information we release about the usage of these strategically significant devices. We do feel comfortable sharing that siphons are being deployed on Starbases all over EVE, and have been extremely successful at liberating the precious moon materials found within. In the two months since Rubicon, over 245 billion isk of moon minerals have been siphoned from the mining towers of New Eden. That’s enough moon minerals to produce over 20,000 Interceptors! 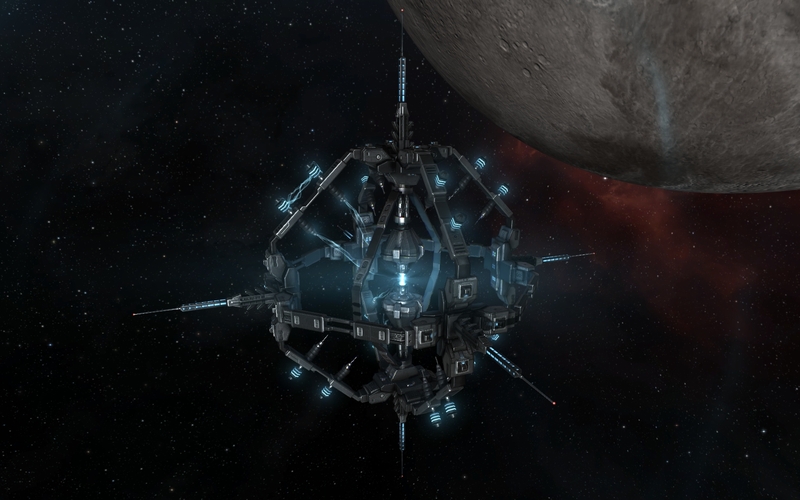 From the start, the development of our new space structure code base was intended to enable a wide variety of additions to EVE Online, and more types of personal mobile structures are a significant part of that plan. As the minutes from last summer’s CSM summit mentioned, we had designs for twelve deployable structures in place as of last summer. We won’t necessarily implement all of these designs (and of course we have added to our collection of potential Mobile Structures with help from our creative community), but two more of those original twelve structures are going to be available to you for the first time in Rubicon 1.1! The Mobile Micro Jump Unit is the first mobility enhancer that we are implementing within the Mobile Structure system. Its functionality will be very familiar to those of you who have used the Large Micro Jump Drive ship module. When active, any player within range can use it to launch their ship 100km in any direction. It has no cooldown between uses or limit to how many ships can use it at once, but it does have a spoolup time of 12 seconds just like the MJD module. The Mobile Micro Jump Unit can be used by any ship that is smaller than a carrier, and does not discriminate between its owner and any other player that tries to use it. It is a one-time use disposable structure with an affordable manufacturing cost of about one million isk and a lifetime of two days. We expect this structure will be especially useful for players who choose to take the time to strategically place them in areas where they will be needed in the future, as well as any player who wishes to take advantage of the power Micro Jump effect on a ship other than the battleships that previously had access to the Large Micro Jump Drive module. To find all the details about the Mobile Micro Jump Unit as well as provide your feedback on the structure, check out this thread in our Features and Ideas forum. The new Mobile Scan Inhibitor is all about control of information. This tool will for the first time allow players to limit the information available to their opponents over a specific area. When active, the Mobile Scan Inhibitor will prevent the operation of both combat probes and directional scanners by or against anything within its 30km radius. The structure itself is always visible to both probes and directional scans, and is extremely easy to pinpoint using probes. This means that any other players in system will be able to easily tell where something might be hiding, but will not know what that something might be. Players that are inside the radius of the Scan Inhibitor will also find their own probes and directional scanners disabled by the structure’s interference, so those hiding behind the Scan Inhibitor will be blinded by the same fog of war as their opponents. The Mobile Scan Inhibitor is another one-time use disposable structure, costs about fifteen million ISK to build, and lasts one hour. The Mobile Scan Inhibitor allows players to wield the power of uncertainty against their enemies, either dissuading a timid opponent from approaching or goading an overconfident one into a carefully laid trap. Information weapons are inherently flexible in their use, and we expect to see many great EVE stories arise from the creative use of these new structures. All the details and discussion about the Mobile Scan Inhibitor you could hope for can be found in this thread in our Features and Ideas forum. Encounter Surveillance System: Now with improvements thanks to your feedback! CCP SoniClover announced the new Encounter Surveillance System in this previous Dev Blog, and he has been working hard to incorporate the excellent feedback our community has provided into improvements to the structure’s design. 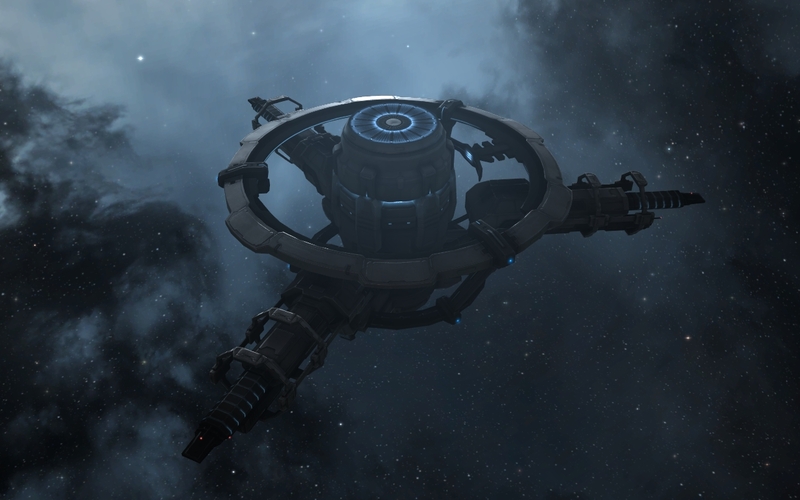 The Encounter Surveillance System is a structure that allows nullsec pirate hunters to optionally increase the rewards of their efforts in exchange for increased risk. This has the effect of giving players more control over their risks and rewards they encounter, as well as providing engaging player interaction as small groups of players can roam through hostile space and attempt to steal riches from the ESS modules deployed throughout nullsec space. When we announced the last iteration of the ESS structure, many players indicated to us that they believed that the risk/reward balance of the structure was out of whack. It was too easy for fast ships to steal ISK from the ESS before the local residents would be able to scramble their defenses, and the potential benefits would not be worth the increased risk to player’s wealth generation. Taking this feedback to heart, SoniClover and our team have improved the ESS with several tweaks that should make usage much more attractive for Nullsec residents and therefore provide a rich target environment for skilled raiders. With an active ESS in system, bounties pay out Loyalty Points in addition to the ISK reward. LP reward starts at 0.15 LP per 1000 ISK and can increase to 0.2 LP per 1000 ISK as the bonus payout increases. This LP reward is given directly to the pilots who collected the bounties and is not stored in the ESS pool. These loyalty points can be redeemed at any station belonging to the Navy corporation belonging to the empire that produced the ESS being used (for example a Caldari Encounter Surveillance System will provide Loyalty Points for the Caldari Navy). There is now no timer to open the ESS window where the player gets to choose to Share or Take all, but both options now have separate timers on them. Share requires 30 seconds, Take all requires 210 seconds. Moving out of range while the timer is ongoing resets the timer. This prevents players from safely leaving an alt on the ESS and sharing as soon as a hostile enters local. Interacting with the ESS now puts a warp disruption effect on the ship interacting with it. Ships immune to bubbles are not immune to this effect. Increased minimum range to stargates and stations from 300km to 3000km. Activation time increased from 60 seconds to 120 seconds. All the same basic functionality of the ESS from the original version remains intact in this iteration, and the extra LP rewards are added on top of the potential increased ISK gain. We want to give a special thanks to all the players who provided valuable feedback to the original ESS proposal and have helped improve the design significantly. The invaluable player-elected representatives in the Council of Stellar Management have also been extremely helpful by collecting and focusing feedback in discussions with our development team. To further discuss these changes to the ESS plan, check out this thread! All of these Mobile Structures are coming your way on Tuesday, January 28th with our Rubicon 1.1 point release. We are very happy to be able to bring you this rapid follow-up to the Rubicon expansion and we hope you enjoy taking advantage of these new tools as much as we have enjoyed making them for you! Thanks for reading, and good hunting!